Are you bored with being so proper? Do you want to have more fun? Mr. Tiger knows exactly how you feel. So he decides to go wild. But does he go too far? There is a time and place for everything...even going wild. A lovely story of identity. Peter Brown has created another lovely picture book that could legitimately be enjoyed by all ages. 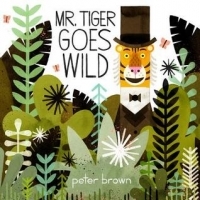 MR. TIGER GOES WILD tells the story of a prim and proper tiger, who lives in a prim and proper city where everyone is always dressed to the nines and follows all the rules. One day Mr. Tiger has an idea, and this idea leads to him behaving quite wildly. He gets more, and more, and more wild, until he's running around the jungle all alone. Mr. Tiger then realizes that he is quite lonely, and his being wild is the cause of his loneliness. The other animals in town welcome Mr. Tiger back, and he settles down a bit. Mr. Tiger learns that to be himself he doesn't have to be completely straight-laced, but he doesn't have to be totally crazy either! The short sentences make it a great book for beginning readers, and the large-scale illustrations make it great for a read-aloud storytime with groups of kids. The only downside is the small font - most of the text is quite small and that could pose a problem for some early readers. The illustrations are incredible. Peter Brown digitally edited ink, watercolor, and gouache illustrations for the entire book, and the difference between the images and a typical picture book is apparent to any level of reader. The earth tones are calming and give the book a very natural tone, which makes the orange of the tiger and his exclamations really pop. MR. TIGER GOES WILD is a great new picture book that I would recommend for all ages.